This 2009 Abraham Lincoln Bicentennial Silver Dollar Proof from the U.S. Mint features a portrait of the 16th President on the obverse and one of the verses from his Gettysburg Address on the reverse. This popular one-year-only commemorative silver dollar was released in 2009 to celebrate the 200th anniversary of Lincoln’s birth and proved to be so popular that both the uncirculated and this Proof version quickly sold out! It should have come as no surprise that these coins would be so popular. After all, Lincoln is ranked as one of the best Presidents ever to serve the United States. His signature moment was the delivery of his famous Gettysburg Address at the dedication of the Soldiers’ National Cemetery in Gettysburg, Pennsylvania on November 19, 1863 nearly five months after the famous battle was fought there. While Lincoln himself didn’t think much of the speech, historians have hailed the monumental oration as one of the most famous speeches in American history. Talk about short and sweet; the famous address lasted barely two minutes! A portion of the proceeds from the sale of these coins went to the Abraham Lincoln Bicentennial Commission to help fund the Lincoln Bicentennial celebration as well as for continued study into the former president’s life. While 375,000 proofs were struck, the fact that they were sold out nearly a decade ago makes finding these commemorative silver proofs tough today. Secure yours now! IMPRESSIVE DESIGN OF THE 16TH PRESIDENT – This coin’s remarkable design commemorates the 200th anniversary of the birth of Abraham Lincoln. The 16th President’s portrait on the obverse was designed by Justin Kunz and Don Everhart and was modeled after Daniel Chester French’s 1915 sculpture located at the Lincoln Memorial in Washington, D.C. 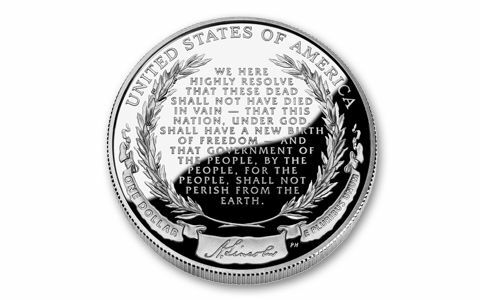 The coin’s reverse was designed by Phebe Hemphill and feature’s some of Lincoln’s most famous words – the final 43 words of his Gettysburg Address – surrounded by a laurel wreath. STRUCK IN FINE SILVER – Each Lincoln Bicentennial Commemorative Proof was struck in 90% fine silver at the Philadelphia Mint. 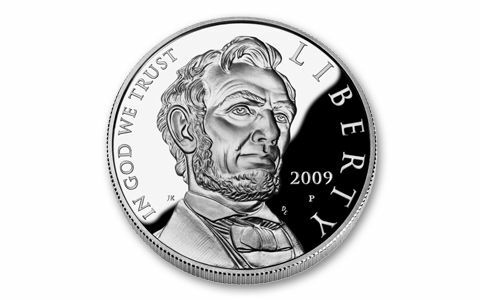 LEGAL-TENDER COMMEMORATIVE COIN – These 2009-P Lincoln Bicentennial Silver Commemorative Proofs are $1 legal tender. GORGEOUS PROOF CONDITION – Your 2009-P Lincoln Bicentennial Silver Commemorative Proof comes in gorgeous proof condition, meaning it was expertly crafted by the mint from hand-selected planchets, polished dies and multiple strikes to produce beautifully frosted details rising over mirror-like fields! 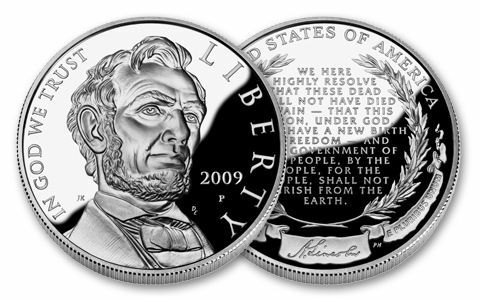 STRICT LIMITED EDITION – The final limit edition for the 2009-P Lincoln Bicentennial Silver Commemorative Proof was reported as being 375,000. These Lincoln Bicentennial Commemorative $1 Silver Proofs are among the most popular modern commemoratives released by the U.S. Mint. Don’t miss this chance to add one of these incredible coins to your collection!